This document is suitable for any organisation in any industry sector. It is drawn for use between members of the same company group or any other closely associated parties. The work is described in an attached schedule. The purpose of the agreement is to clarify the rights of the parties against each other. 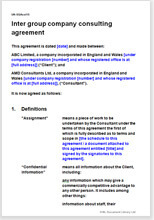 to clarify inter-company rights before a sales of shares or introduction of a new lender. This contract is drawn with a view to fairness between two equal parties. If you wish to prefer the interest of one party, you should use Consultant contract: corporate; full or Consultancy contract: client appoints. This consultancy contract contains broadly the same provisions you would expect to find in any commercial consultancy document. There are no implied “friendly terms” on account of the parties being associated. This contract assumes that the consultant may have deep involvement in your secrets and technology. This can be applied to any special knowledge.